Herbs de Provence is a culmination of popular herbs used in Southern French cuisine. Before commercial bottles of herbs came along, Grandmothers would walk the hillside picking herbs to flavor their meats and soups. The herbs used depended on the chef. Some might use a combination of bay leaf, thyme, fennel, rosemary, chervil, oregano, summer savory, tarragon, mint, and marjoram. Lavender was not a traditional herb but is commonly found in jars of Herbs de Provence. 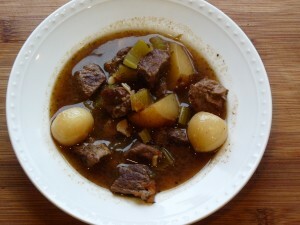 Traditional or not, the lavender is what I love most about this version of beef stew. There is this depth to the stew. I can only describe it as romance and silk scarves sauntering in the breeze. Cunning like a black widow toying with her prey. Very French. Very Amazing and delicious. Heat a large skillet over medium heat, add 1 tablespoon olive oil, swirl to coat the bottom of the pan. Cook the meat, in batches, in the skillet. Cook several minutes on each side until brown; transfer to the crock pot. Deglaze the pan with the cranberry juice, scraping up the browned bits from the bottom of the skillet. Pour the mixture into the crock pot. Add the celery, leaves, onion, garlic and potatoes to the crock pot. Pour in the tomatoes and beef stock; season with rosemary bay leaf, Herbs de Provence and salt and pepper. Cover and cook on low heat for 4 to 5 hours. After 6 hours check the meat and potatoes for tenderness. The meat should almost fall apart.